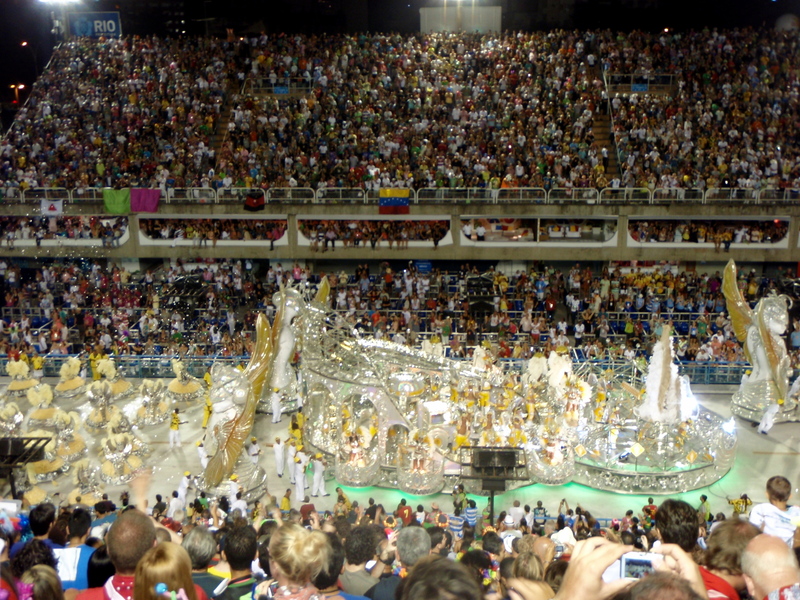 Home » Brazil » The Samba Parade, Part 2: The Survival. The Samba Parade, Part 2: The Survival. So what does one wear to a Samba parade? Answer: Anything or next to nothing if you wish… as long as your costume is not big. While in line, two Australian guys who looked like they walked out of a Samba parade, were asked to discard their costumes because of their size, heart breaking, but the stands were packed so the request was understandable. We kept our attire low key. 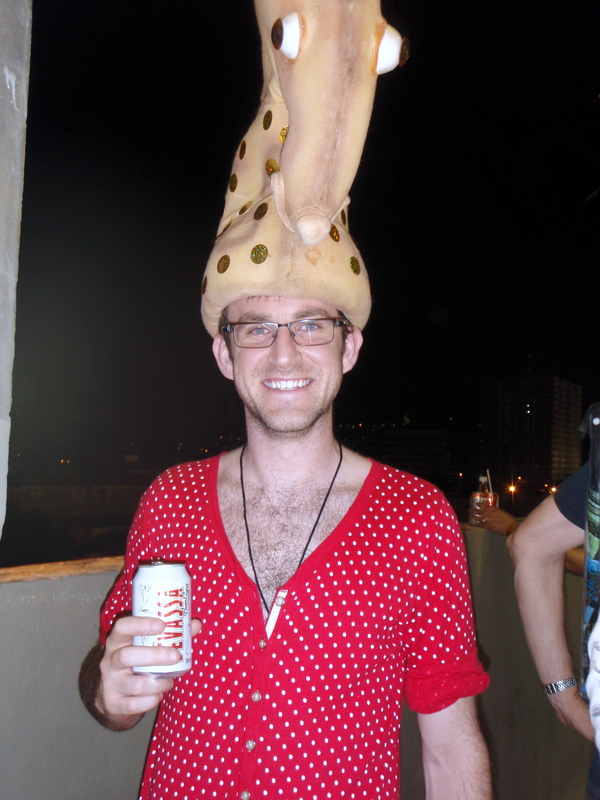 Ben in his red and white poke-a-dotted onesie with discarded giraffe, elk hybrid hat… nothing but class. I in a curly purple wig and a silver Carnival mask I picked up at street vendor for 18 Reals. Another option is to run away and join the Carnival! To samba in the parade with one of the schools requires a costume that you can actually buy from them online! Once you have their outfit you can join the Samba Parade with that school. 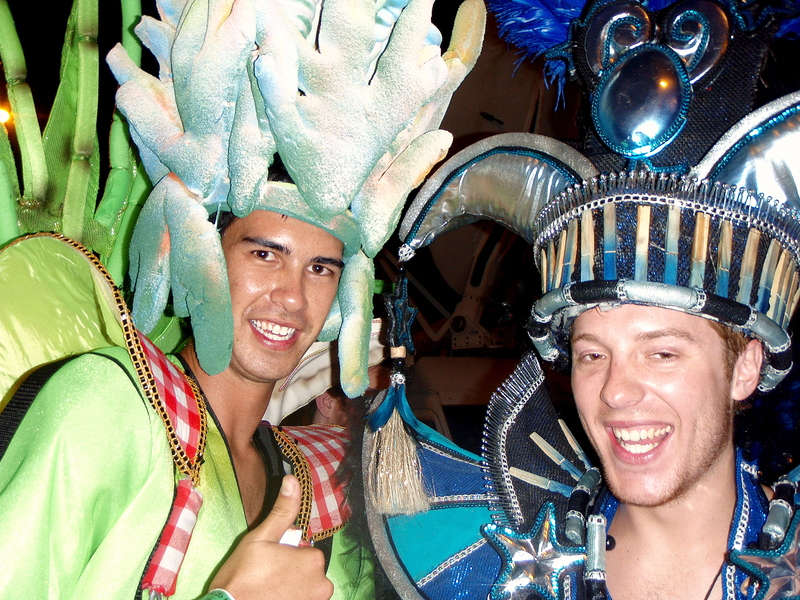 Costumes range anywhere from $195 to $1300 US Dollars plus the purchase of a Parade ticket ($100 US Dollars). We sat in Section 4, which is a General Admission Grandstand. Every $100 US Dollar seat had an amazing view but get there a few hours early if you want to grab a closer seat. The closer you are the more detail you can see in the elaborate costumes and the more you can feel the beat of the more then 300 samba drums. Bring water and food in your backpack since the parade is eight hours long. You can leave whenever you want but the floats do seem to get progressively more spectacular as the night goes on so try to stick it out until the end. We didn’t bring snacks or water… clueless, so we ended up spending a small fortune. Beer and snacks are sold in the stands and in booths just like any US sporting event. Bring a poncho since umbrellas are discouraged because it obstructs the view. We only brought our umbrella and could only use it during samba school intermissions. Count on it raining, you are in Brazil, the land of Rain Forests. Bring or buy a seat cushion or follow the Parade program. Seat cushions are good way to stake your claim on seats during samba school intermissions. I, however, just followed the program and sat down after the last float went by guaranteeing myself a coveted spot during the intermissions… smart. 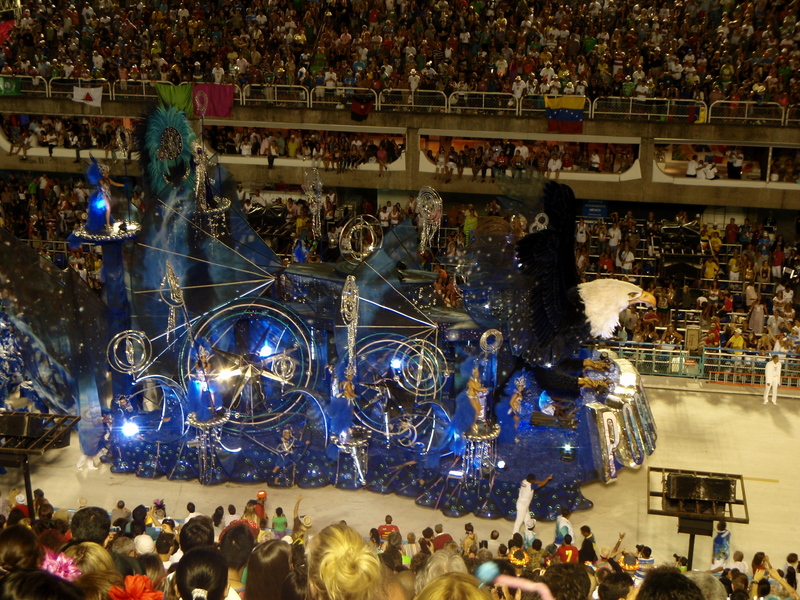 The last float for the Portela School, this was the school most effected by the warehouse fires. 3.) What to know? The secrets no one tells you, but we will! Know your samba songs. 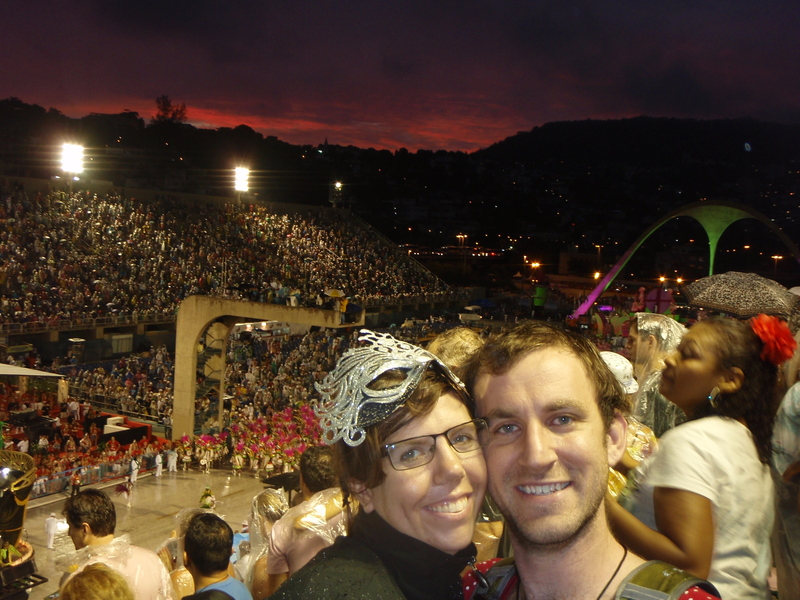 Get on The Rio Carnival Guide website: http://www.rio-carnival.net/ or other similar websites and learn that year’s Samba songs. Everyone will be singing along to them. To feel like a true Carioca (Someone who is from Rio de Janeiro) you have to know at least the favorites to get by. Do not buy your tickets ahead of time. Many international tourists (Ben and I included) buy tickets for both Sunday and Monday. After barely surviving Sunday night, many tourists sell or even give away their Monday night tickets! We sold ours at a $50 dollar discount. In fact the guy we sold our tickets to ended up acquiring 2 more tickets for free! You can easily acquire them at a hostel or on couchsurfing.com. We survived. Our reward? A beautiful sunrise. I like what you guys are up too. Such intelligent work and reporting! Carry on the superb works guys I’ve incorporated you guys to my blogroll. I think it’ll improve the value of my site :). “Live among men as if God beheld you speak to God as if men were listening.” by Seneca.